Own Vikings - Axe Mug from Deff, DVD, Blu-Ray & 4K Video Specialists - Free UK Delivery..
Own Vikings - Beach Framed Print 30 x 75 from Deff, DVD, Blu-Ray & 4K Video Specialists - Free UK Delivery..
Own Vikings - Beach Mug from Deff, DVD, Blu-Ray & 4K Video Specialists - Free UK Delivery..
Own Vikings - Blood Landscape Framed Print 30 x 40 from Deff, DVD, Blu-Ray & 4K Video Specialists - Free UK Delivery..
Own Vikings - Blue V Mug from Deff, DVD, Blu-Ray & 4K Video Specialists - Free UK Delivery..
Own Vikings - Fate Mug from Deff, DVD, Blu-Ray & 4K Video Specialists - Free UK Delivery..
Own Vikings - Keep Calm Mug from Deff, DVD, Blu-Ray & 4K Video Specialists - Free UK Delivery..
Own Vikings - Key Art Framed Print 30 x 40 from Deff, DVD, Blu-Ray & 4K Video Specialists - Free UK Delivery..
Own Vikings - Logo Mug from Deff, DVD, Blu-Ray & 4K Video Specialists - Free UK Delivery..
Own Vikings - Table Mug from Deff, DVD, Blu-Ray & 4K Video Specialists - Free UK Delivery..
Own Vikings - Viking Mug from Deff, DVD, Blu-Ray & 4K Video Specialists - Free UK Delivery.. Journey to a thrilling ancient world in this epic new series about history's bravest and most brutally fearsome warriors... Vikings. Ragnar, a would-be Viking chieftain, longs to fulfil his destiny as an explorer and conqueror, alongside his ambitious brother Rollo and loyal wife Lagertha. But as Ragnar leads daring raids in distant realms across the ocean, treacherous forces in his Norse homeland conspire against him. Faced with shocki.. Muster your courage for a second riveting journey into the savage world of Vikings. Season Two follows the ongoing fortunes of Ragnar, the Norse warrior who has now become a respected leader on and off the battleground. But more power brings an onslaught of deadly threats and impossible choices. As he prepares to cross swords with his own brother Rollo, Ragnar is torn between his wife Lagertha and his lover Princess Aslaug…with his son,.. Prepare to raid and wage battle once again, in an ancient kingdom dominated by vengeance, lust and thrilling conquest, in Season 3 of Vikings. The gripping family saga of Ragnar, Rollo, Lagertha and Bjorn continues as loyalties are questioned and bonds of blood are tested. 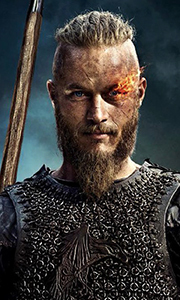 Now king of his people, Ragnar remains a restless wanderer, leading his band of Norse warriors on epic adventures from the shores of Essex to the mythical city of Par..
Take another gripping voyage into the ruthless world of Vikings, with its thrilling action, powerful performances and intriguing story line. King Ragnar returns from battle gravely ill. Disheartened by his marriage to Aslaug and challenges with his sons, Ragnar seeks companionship with his slave Yidu. Meanwhile, a defiant Rollo remains in Frankia, Queen Kwenthrith plots to reclaim Mercia, and the enigmatic Harald Finehair appears. Ultim.. Battles, treachery and power grabs rage on in Vikings Season 4, Volume 2! After Ragnar's return to Kattegat escalates tension among his sons, he and Ivar the Boneless set out to fight the Saxons. Meanwhile, a prophecy that a woman will rule Kattegat deepens the feud between Aslaug and Lagertha. With its fascinating plot twists, seething emotion and spectacular effects, this breathtaking series continues to conquer. Go behind the scenes .. Experience the action, betrayal and lustful adventure of Vikings Season 4! Following his defeat in battle, Ragnar Lothbrok returns to Kattegat humbled, but defiant. His brother Rollo, now his nemesis, remains in Frankia, while Ragnar's sons compete against one another to succeed their father. Determined to save what remains of his legacy despite his divided family, Ragnar makes a perilous voyage to England with son Ivar, intent on attac.. Journey to an ancient world of exploration, betrayal and high-stakes power struggles with the first four seasons of Vikings. Although Norse warrior brothers Ragnar and Rollo begin as allies on and off the battlefield, jealousy and ambition pit them against one another. Determined to leave a legacy to his own sons, the restless Ragnar engages in conquests, sometimes amidst shame and defeat. All the while, two women he has loved – Aslaug ..
Own Vikings Seasons 1 to 4 DVD from Deff, DVD, Blu-Ray & 4K Video Specialists - Free UK Delivery..
Own Vikings Season 4 - Volume 1 DVD from Deff, DVD, Blu-Ray & 4K Video Specialists - Free UK Delivery..
Own Vikings Season 4 - Volume 2 DVD from Deff, DVD, Blu-Ray & 4K Video Specialists - Free UK Delivery..
Own Vikings Season 5 Volume 1 Blu-Ray from Deff, DVD, Blu-Ray & 4K Video Specialists - Free UK Delivery..
Own Vikings Season 5 Volume 1 DVD from Deff, DVD, Blu-Ray & 4K Video Specialists - Free UK Delivery..